Google is said to be working on a Pixel 3 Lite with watered-down specs. It will reportedly arrive in the next few months at a mid-range price tag. However, fans are more excited about Google’s next-gen flagship dubbed the Pixel 4. Even though the Google Pixel 4 is several months away, early leaks and rumors have already started surfacing online. Let’s take a look at the rumored features, specs, price, and release date of Google Pixel 4. Smartphone design is not Google’s biggest strength. But the search engine giant has done a decent job with the previous generation Pixel phones. Just like its predecessors, the Google Pixel 4 is expected to have a two-tone rear panel. Last month, Google filed a patent for a notch-less, all-glass smartphone. It retains the two-tone design. The top quarter of the back panel features a single camera lens and an LED flash. The bottom three quarters feature a circular fingerprint sensor. The same patent suggests the device would see significant changes on the front. The current Pixel 3 has thick bezels at the top and bottom. The larger Pixel 3 XL has a display notch at the top but retains a chin at the bottom. The patent suggests the Pixel 4 would have a fully bezel-less and notch-less display. The patent also hints at a USB Type-C port. If Google indeed opts for a fully bezel-less and notch-less design, it will be interesting to see where the front-facing cameras will be placed. The search engine giant could go with a circular punch-hole display similar to Samsung’s upcoming Galaxy S10. Or it could use a sliding camera system where the cameras slide up when you launch the camera app. Oppo has implemented similar technology in its Find X smartphone. A bezel-less design would allow Google to pack a bigger display without increasing the form factor of its upcoming phones. The Pixel 4 screen size could go up to 6 inches from 5.5 inches on Pixel 3. The Pixel 4 XL could get a 6.5-inch display compared to 6.3-inch on the Pixel 3 XL. The last year’s Pixel 3 and Pixel 3 XL had just 4GB RAM with 64GB or 128GB of internal storage options. But most other flagship Android phones have moved to 8GB RAM. We expect the Google Pixel 4 to offer at least 6GB RAM. The storage options might stay the same because Google offers free Google Drive storage to Pixel users. The device would run Qualcomm’s latest Snapdragon 855 processor. 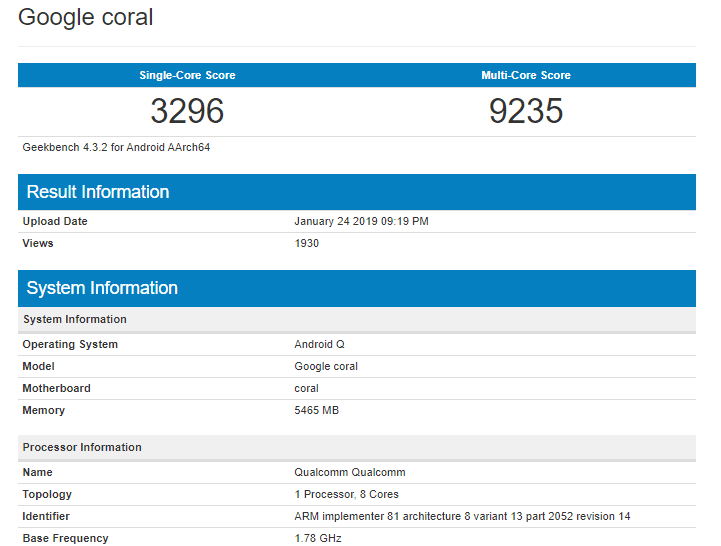 A few days ago, a device named Google Coral appeared on Geekbench with 6GB RAM, Android Q software, and Snapdragon 855. Industry experts believe it’s the upcoming Google Pixel 4. The device scored 3296 points in single-core and 9235 points in multi-core tests, which is in line with other devices running the Snapdragon 855 processor. The performance of the final version could be even better due to software optimization. It’s too early to say whether the Pixel 4 would offer 5G support, but it’s not out of the realm of possibility. Qualcomm’s Snapdragon X50 modem would power many 5G smartphones this year from Samsung, OnePlus, and other vendors. Google could use the same modem in the Pixel 4 if it chooses to offer 5G compatibility. Google’s rivals have been offering dual, triple, and even four cameras on their phones. But the search engine giant has so far resisted the temptation to join the race. Instead, it has focused on AI and machine learning to enhance the photography experience. Last year’s Pixel 3 had only a single 12.2-megapixel camera on the back but dual cameras on the front for selfies. According to Google’s patent filing, the Pixel 4 would stick to the single lens on the back. It could bring some under the hood changes to take better pictures. The 2018 Pixel 3 is still one of the best smartphone cameras out there. Last month, folks at XDA Developers got their hands on the early Android 10 Q leaked build. The Pixel 4 would be the first smartphone to run the Android Q software. XDA Developers found that the software would bring system-wide Dark Mode. Users will be able to enable the Dark Mode from Display settings. You can choose to keep it enabled all the time or you can set it to turn on automatically depending on the time of the day. Once it’s enabled, the Launcher, Settings, Files, apps, and all other aspects of the interface gain a dark theme. The Dark Mode will also save battery on phones with OLED screens. The Android Q software will also bring better privacy controls. For instance, apps will be able to access your location only when they are in use. XDA Developers noted that the Android Q would offer an external display mode similar to Samsung’s DeX feature. 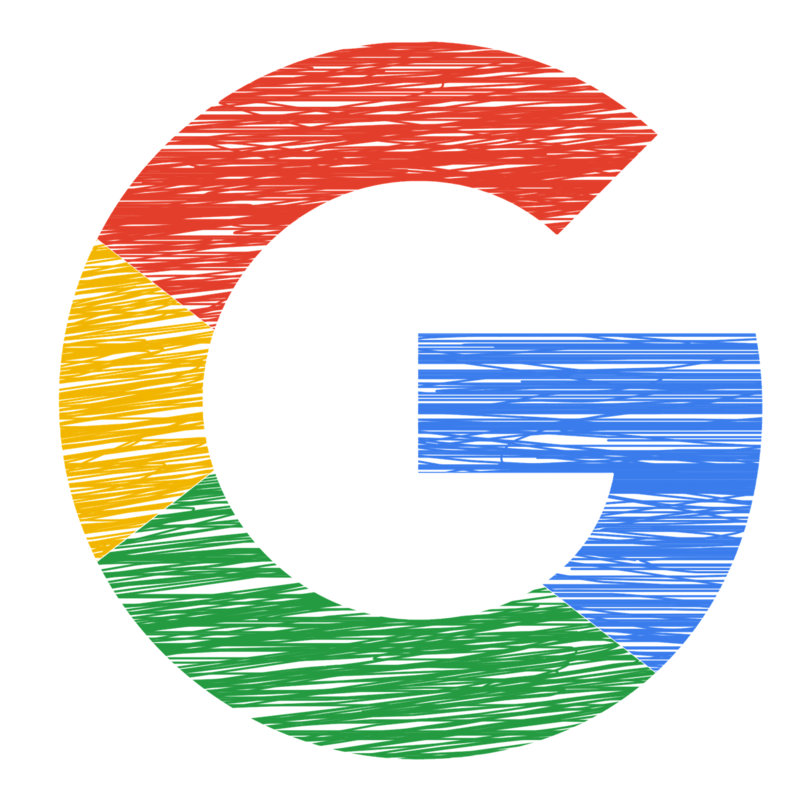 It indicates that Google could launch its own dock hardware along with the Pixel 4. The search engine giant has traditionally launched its Pixel phones in October. The original Pixel arrived on October 4th, 2016 while the Pixel 2 and Pixel 2 XL were unveiled on October 4th, 2017. Last year, the Pixel 3 and Pixel 3 XL were announced on October 9th. If Google follows the same release cycle, we should expect the Google Pixel 4 to launch in the first half of October. The original Pixel and Pixel XL had the starting prices of $649 and $769, respectively. But the company has been increasing the prices of its flagship phones with each new model. The Pixel 2 had the same $649 price tag as its predecessor, but the Pixel 2 XL was priced at $849. The Pixel 3 was even more expensive at $799. So was the Pixel 3 XL at $899. We expect the Pixel 4 to start at above $800 while the Pixel 4 XL could have a price closer to $1,000.